Open a drawer equipped with Blum Tandem Plus Blumotion slides, and by the time it's closed, you'll be won over. Incredibly smooth full-extension action combined with a self closing mechanism that engages 2" before the drawer is closed, and ever so gently eases it back into the cabinet, make these slides truly top-of-the-line. Add to that the fact that the slides are totally concealed - no clunky metal to detract from the beauty of your wooden drawers - and you have a recipe for a classic. This newest generation of Tandem Plus Blumotion features mounting holes on the bottom of the slide housing (except 12" slide) so you can mount the slides directly to a horizontal surface. 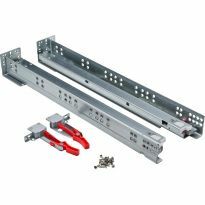 TANDEM runners are designed for the American 3" increment cabinet depth system. This feature permits overlay or inset applications to use the same runner. Full length runners make installation in panel or face frame cabinets possible. For faster, more flexible adjustment of your drawer fronts, try the optional Adjustable Drawer Locking Device (#46209), which replaces the standard locking device that come with the slides. Lengths Available: 9'', 12'', 15'', 18'', and 21'' (Note that these are the exact length of the drawer. Not the length of the slide. Got excellent advice from Rockler employees concerning installation technique. These drawer slides have to be the best on the market. Easy to install and the work perfectly. They are all I will ever use. These slides are the defacto standard and for good reason. They install and operate flawlessly. Solid, worth the extra. Go to rockler videos and YouTube site, to see how others have installed theirs. These slides are the best, but they are very expensive when doing an entire kitchen. They are absolutely the best. 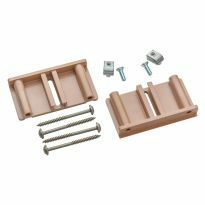 The package from Rockler includes all that you need to install them, including screws and brackets. A paper template for locating notches in the read drawer panel would be helpful. Blum is simply the Quality Standard for cabinet drawer slides and door hinges. Needed to built two 21 inch deep pull out shelf by 43 wide. It was to hold ceramic dishes and heavy dishes. It had to have a high load rating. It worked beautifully. I added additional support screws to the bump out stiles since it was to be attached to the cabinet sides. The static load rating was 90 lbs. When you subtract the weight of the shelf, it was more than enough for the weight. Had to get the instructions on the internet. Makes customer happy. Easy instructions. Lots of adjustments. I have used Blum products for years with no problems. Get very familiar with the instructions and follow them to the letter. 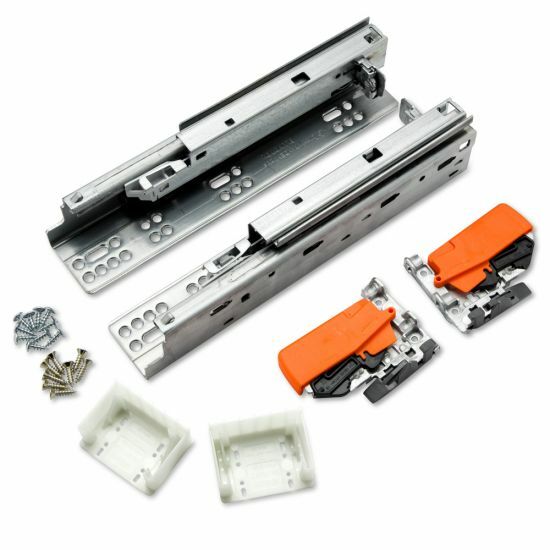 If this is your first time installing the Blum slides, I encourage you to watch a video or two as the installation instructions don't offer a lot of detail. If you follow the steps and measure carefully, the slides will work exactly as advertised. The end result gives you a very professional look and feel. Easy installation and smooth, solid design. Grab the jigs to simplify the process. They are great, after you get them adjusted properly. Very easy to install. A bit apprehensive about getting these expensive slides installed, but getting the front to back and side to side measurements and locating same in the cabinet was pretty easy. 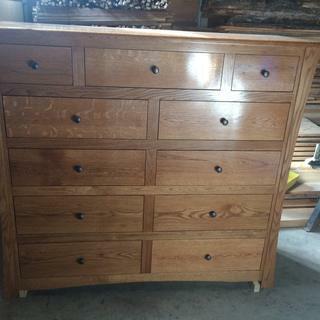 The drawers work perfectly and have the smooth solid feel that we were looking for. We will buy them again. Pricey, but a quality product. No special tools or jigs were needed. Installation straight forward. A fantastic product with very clear instructional videos on YouTube. These are great slides. You get what u pay for. 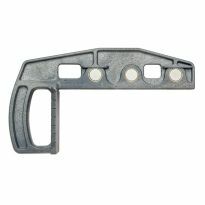 Save time and frustration and purchase both the lock latch jig and the face frame mounting jig. Best drawer slide. The instructions while overflowing still lack some key details that i was able to find googling orher woodworkers that shared their experiences. i didn’t buy the jig to drill the holes couldn’t justify the money for just a few drawers but i took my time and it worked out just fine without the jig. if doing alot of drawers the jig is a no brainer. These were very easy to setup and offer plenty of adjustment for a beginner like me. these rails are one of the easiest to install. 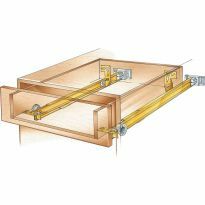 Blum tandem drawer slides. Under drawer mount. The Blumotion slides are a well built and easy to install. The design is forgiving and allows for an easy install. I would recommend and use this product again. Love them! After I figured out how to install they are an DIY project. My drawers were slightly bigger than 21", so I had to adapt. Front release pieces are set slightly back. Drawers still open almost all the way - you can still get to everything in the back of the drawer. These are the only slides I use anymore. Just wish the instructions weren't so muddled. Once installed they work excellent. Great title and exactly what it is! 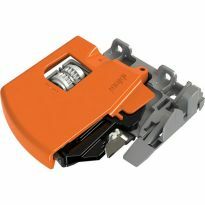 The Blum soft closing slide was just what I. Redefining to replace a failed slide on a drawer of master bath that we have not neen able to find replacement , since the manufacture is no longer in business. The new Blum works great and I plan to replace all the other slide with Blum . Very good product. Four of ten of the left slides rear adjustment tabs were broken upon arrival, but customer service resolved that problem quickly. Very professional. Directions are nil, but with a little Internet searching and synthesis it became apparent that a well written instruction set may be of use to those with little experience working with drawers and slides. There's no doubt that these slides make for a very classy final product. I wanted a smooth, reliable drawer. The drawer is unusually wide and shallow, and I have had experience with drawers racking when this width to length ratio greater than about 1.5. 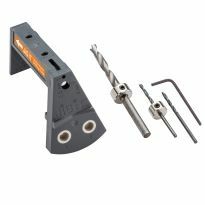 The Blum slides work smoothly with this ratio of width to depth. Great hinges and drawer slides for almost any application. Bought 1 to test, then ordered enough to finish the job. Don't let the instructions, with all the needless mm to inch conversions, put you off. Once I did the first one, I could do the rest very quickly and easily. These are robust and work great! Extremely smooth operation. Installation was east and didn't need to down load instructions. I have had these slides in the kitchen for 2 years now, with no issues. Worth the extra money. These were the best drawer slides I have used. Extremely easy to install. I started with another brand and was frustrated with the tight tolerances. I am now only using this style of slide. The drawer slid fit perfectly zero trouble. I used two pair for large kitchen drawers. This was my first time using this product, will not be the last. I think these do a great job. I have to say that I haven't installed these beofre. The instructions on the Blum Website are a little to be desired in the fact that I believe there isn't much instruction on how to install these things. The first set was a bottom mount. So not difficult. Built my confidence. The second one was a drawer. A bit trickier took me loner. But they are fabulous. Keeps my drawers shut because my family is not good at closing drawers. Still have not figured out the back adjustment thing. Will continue to figure that out as well. Many good ratings, will see for myself. I've used them before. They are the BEST!! Wanted to try and replace the existing drawer slides that are not full extension on my kitchen cabinets. The current slides are Blum also, just don't open completely. High quality slide for a high quality cabinet. Quality and precision product. Great action with the Blumotion. Good quality. Easy installation. Work right the first time. Have used Accuride in the past but they no longer seem to make a soft, self closing bottom mount slide. Have used Blum soft closing hinges so thought I'd try them. Smooth operation and easy to adjust. Customers are always impressed with the end result. I’ve used these in the past and they’re easy to install and have stood up to daily use for over 10 years in a kitchen environment. They’re the only drawer slides I install. I have used these slides on furniture and cabinets, they are durable, easy to install, and everyone loves the Blumotiom feature and the hidden slides. They were recommended by a cabinet making article in the Taunton Press. Used before and excellent product. Not at all happy that your site says free shipping but you charged me 19.99 on order >$35. Previous use, the best around. Great slides used them before. Blum has always been a quality brand and I am using them for new kitchen cabinets in my own home. Best quality that I have used. I purchased one set of drawer slides to try out on our kitchen cabinets. If these work, I will be buying more. Part required for college course. 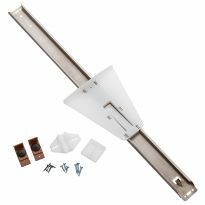 ALTHOUGH THEY ARE A LITTLE MORE DIFFICULT TO INSTALL AND GET FLUSH, I THINK THEY ARE THE BEST FOR THE KITCHEN, BATHROOMS AND DRESSERS. These slides are sturdy, reliable, and easy to install. thes work great and are fairly easy to install. These are so smooth, easy to use and install. After using these once I’ve never gone back to side mount. i'm building a high end cabinet, so I wanted to buy the best drawer slides I could find. These were recommended by a neighbor. He tried the budget slides, but had lots of problems. He switched to these and they work great. This is by far the best price i could find for these slides. These are simply the best drawer slides on the market. Used many over several years, still work great. The depth of my cabinet is 24" and the total length of the drawer is 22", what size of Blum tandem should I use ? I have 21 inch drawers but the the drawer box is 3/4 inch thick. Will this drawer glides work with this drawer? BEST ANSWER: No. As noted in the description, they can handle a maximum drawer side thickness of ⅝". Blum does make an undercount glide for ¾" material - they are the F & A series. (I believe these are the H series.) I don't know if Rockler carries the other series or not as they don't specifically list the part numbers. If you need to use ¾" material, your options are to either trim/rabbit the bottom of the drawer sides to ⅝" or buy the glides designed for ¾" material. If I buy 21" slides, what is my depth of cabinet to being built? BEST ANSWER: Typically, you would use a 21" slide with a cabinet that is 24" deep, which is a standard cabinet depth (typically kitchen boxes). Over the years, Blum (German company) has engineered their entire line of slides to conform to the cabinet construction standards in North America. Can these slides be used if I am looking to only mount the cabinet member to the bottom of cabinet, and not the side of the cabinet wall? BEST ANSWER: Yes, these slides can be mounted to the sides or bottom of the cabinet enclosure. 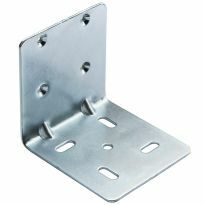 They also can be mounted to the face frame and back of the cabinet with the provided hanger. Is there any side adjustment on these drawer slides, to allow for small variations in width of cabinet? If so, how much? BEST ANSWER: The short answer in No. However if your drawer is less in width than the directions require you could add a filler strip along one side to make up the difference. 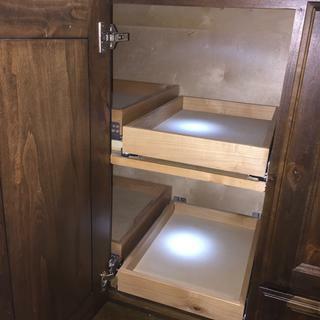 If you are concerned that the inside of the cabinet isn't exactly square to the drawer you could add a shim wherever you need to. Doing so might require some trial and error. Of the six drawers that I've made and installed I'd be hard pressed to say that my measurements were exactly right-on. There's probably a little slop built in to the scheduled measurements within the directions. Otherwise I'd still be fussing with mine. All in all my feelings for these drawer slides is that after you get through the first one it gets a lot easier. I'm not trying to be flippant but the question is illogical for this type of drawer slide. The important dimensions are width is on the inside and front to back is inside of front to outside of back. There are two different sizes of drawer slides depending upon the drawer box thickness. You could use the 19mm version with 1/2" drawer box material but I wouldn't. The carcass MUST have parallel sides where the slides are mounted. If you're unsure, the best thing to do is to mount the slides, then take measurements and make your drawer box. Just fit the drawer box to the slide. There is a bit of width slop allowed but it is specified as the thickness of the drawer box material. I usually make my drawer boxes 1/32 larger (Inside dimension) in width but the F/B has to be right on. how to adjustment of the soft close to close softer? 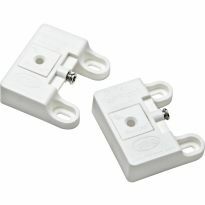 do these come with the rear mount brackets? BEST ANSWER: Yes they do. It mounts to the back of the cabinet wall. You may have to put a spacer if the cabinet is deeper than the bracket allows. Yes they do and its easy to install. Yes, the rear brackets are included. I want to create a 12" deep waste cabinet but all the "rev" and other products are for typical 21" deep base cabinets. In my case the "base" cabinet is actually an "upper" cabinet that is only 12" deep x 15" wide x 30" high. I'd love to be able to put a pull out waste bin in the cabinet for all of the spam snail mail I receive. Any suggestions? BEST ANSWER: Think drawer, or possibly drawers, and use 12 inch full extension or over extension slides. Be careful. 12 inch slides are actually 12 3/4 inch long. Nope, it would have to be at least 21" deep. We have to replace with side wall mounted slides..do you have an option for that? BEST ANSWER: Just put the screws into the side . There are holes for that. 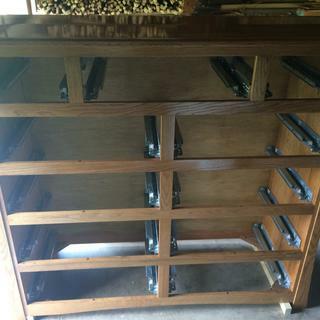 Can these drawer slides be used outside in a kitchen island? BEST ANSWER: I really do not know. If by "outside" you mean the slides could get wet with rain, I would say no. These things appear to be intended for dry service. BUT, they seem to operate well year in and year out in kitchens and bathrooms where relative humidity is sometimes high. I suggest you contact the manufacturer or a knowledgible vendor for better info. Not sure what you mean by the question. Please clarify "outside". If you mean outside as in a covered patio/porch, they should hold up with no problems. All of the ones I have used are used inside mounted to drawers and slide-out shelves. Some are in a kitchen island. I think it would just depend on their location. Is it a covered area? What is the humidity in your part of the country? The slides I believe are zinc plated. If they are exposed to wet weather or salt air, I would find something that was stainless steel if possible. Any drawer slides used outdoors should be made from stainless steel. Even zinc coated metals will rust over time. Absolutely; they are made of stainless steel, and are holding up outside with no issues . Not sure if these are weatherproof so I would estimate and you facture that? Are the rear mounting brackets absolutely necessary? My face frames are flush with the inside of the cabinet, and I'd like to just use the holes on the side rails for mounting. BEST ANSWER: No, you do not need them. The slides need to be flush with the opening. The rear brackets are for when the face frame is NOT flush with the side of the cabinet. 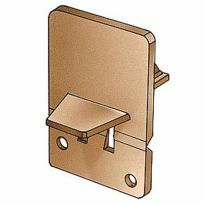 If your face frame was NOT flush and you did not have these brackets, you would have to make a shim to fill the space between the cabinet wall and face frame edge. It sounds like you have what's referred to as Euro style cabinets. The glides should be able to mount to the side walls of the cabinet, without having to use the rear bracket - if I have interpreted your application correctly - if there are holes available to place screws through. You can mount the slides using the side holes or the brackets to hold the back. In all the literature, and videos, the drawer faces are outside the cabinet case. Can these slides be installed so that they can be used with flush, or inset drawer faces? BEST ANSWER: yes, as long as you have a separate drawer front to hide the extra space required at the bottom, and enough depth in the cabinet. I built an inset drawer using these slides, as reviewers have noted, take the time to read the instructions completely so that you understand the slides before you cut your first piece of wood. Sure, as long as the cabinet is deep enough to allow for the drawer thickness. In most cases this shouldn't be a problem. To install flush would involve some careful measuring or maybe a stop on the inside. Can you use these on a 3/4" drawer instead of 5/8th? BEST ANSWER: I am guessing you are referring to the recess on the bottom of the drawer. Short answer is no. Long answer is you would need to shim them out or take the boxes apart and re-cut the dado for the bottom. Shimming out by covering the whole bottom with 1/8 inch plywood may be the answer. locking device holes and accurate boring for rear hook holes." No T65.1600 template was provided with the drawer slides. No mention of this template in any of the reviews or Q&A. Is the T65.1600 template necessary? If so, where can I buy one? I purchased my drawer slides at Rockler but can't find the template there. BEST ANSWER: I installed the slides on a 5-drw chest. They are really nice but EXTREMELY difficult to install. I did not have the template. It took lots of patience and modeling to get it right. I won't use them again, but if I did I'm sure it would be much easier. I was trying to match other furniture that had them. I was trying to maximize the drawer space. If I had used the recommended dimensions, they probably would have gone in with no trouble, but I would have given up valuable drawer space. My drawer is a total of 9", will a 9" slide work? 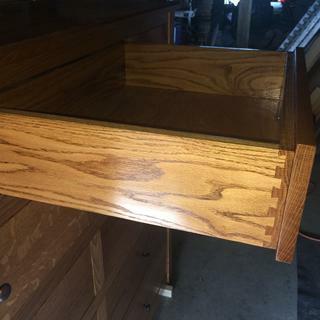 The drawer has to be 1/2" recessed and drilled and notched on the back of the drawer. It has to be 1/2" narrower than the opening. The drawer face also has to be an overlay. Hope this helps! Do the 12 inch slides fully extend drawer out of face frame? 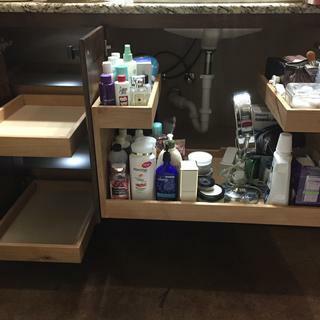 BEST ANSWER: Yes, they come out flush with the face frame, however, if the drawer is immediately under the counter, the counter overhang will slightly interfere. yes, if you set the slide out to the front edge of the face of the cabinet. Yes it works perfect. Easy install no problem. 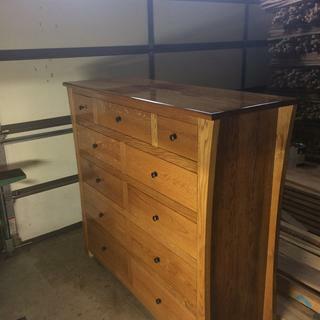 Item #: 44034 work on these drawers cabinet ID is 22 inches? BEST ANSWER: I've installed dozens of these & very satisfied w/ performance. The 21" TBDS length should fit nicely in your 22" deep cabinets. 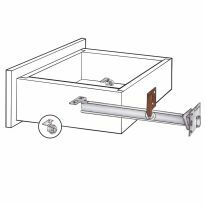 However, your drawer depth is limited to 18" so the back, fixed bayonet slide mount and the front removable clip set will fit witin the overall slide framework and the underneath of your finished drawer. Can you easily shorten the 20" drawer box to 18"? 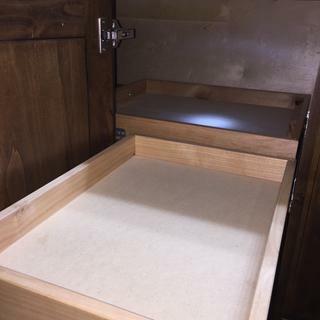 For the undermount slide mechanism to be completely invisible when the drawer is open, yoru drawer bottom needs to have a minimum space of 1/2" between bottom of drawer side and the drawer bottom. Installation instruction sheet that should come with the slides has dimensions and a drawing showing clearances & critical dimensions. 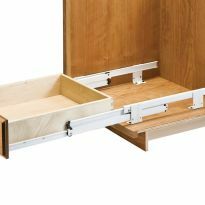 With the blumotion drawer slides the drawer box needs to be the exact length of the drawer slide... So it would need to be 21 inches... There is a piece of metal on the back of the slide that needs to go into a hole (that you drill) in the back of the drawer box... So if you could add an inch of material on the back of the drawer box it would work. Also, you will need 1/2 inch between the bottom of the drawer and the bottom of the drawer panel. John you should have no problem. The rear bracket that is included will give you the ability to make an adjustment. I have used these on 22' OD drawers with no problem. Good luck with your project. The depth of my cabinet minus the 3/4 face is 16 inches. Do I buy the 12 inch or the 15 inch? BEST ANSWER: My guess is the 15" slides. You'll probably have to install a floater to give the slide a place to be anchored to. I think that the clips intended to support the rear of the slides are too short to account for the 1¾" extra space. In reality, this is a question that Rockler customer service / technical support could answer more expertly. Go as long as you can. This will give you the ability to get better drawer extension. The 15's would be my choice. I have a 12" deep cabinet, do I need 12" or 9" slides? BEST ANSWER: It's been a while but as I recall the important measure is the length of the drawer and there is not a lot of tolerance for that. I ended up adjusting the length of the drawers to accommodate the slides. Their web site might be a better place to look. It depends on the type of drawer. Unless you are doing full overlay drawers, you have to account for the drawer face thickness. How do I insert a drawer on the slides? I removed the drawer and I'm not able to insert it with the correct vertical alignment. BEST ANSWER: The drawer should just sit on top of the slides and when you push it in it will click into place. If the alignment has changed,. Each slide has a cam near the pin that fits into the back of the drawer that allows adjustment of height of the back of the drawer. Some of the latches (at the front of the drawer) allow multiple adjustment (up, down, left right). If the drawer is still out of alignment, then you should check the slides themselves have not been dislodged during the removal process. Hello Edward thanks for your fast response. I got the drawer properly inserted by playing with the latches at the front of the drawer. Pull the slides all the way out then place the drawer on the extended slides. Push the drawer all the way in and the locks will click in. Just make sure the "tang" on the rear of the slide fits in the hole in the back of the drawer box. Thanks I found small grey latches on the bottom of the drawer. They needed to be reset. Then the drawer worked perfectly. is there a limit to how wide the drawer can be? BEST ANSWER: I don't believe so. However, you will be limited by how much weight you intend to put inside the drawer. Also, depth is critical. It seems any reasonable width should work as long as the weight limit is not exceeded. These are rugged and extremely well made. I am designing a nightstand that will have 1 drawer and the drawer front has a curve to the top (like a smile). The back will be open to allow light to pass through the front. Do you have to use the rear mounting bracket? Or is there another way to secure it? BEST ANSWER: The rear will need to be supported somehow. You don't need to use the bracket, but you'll need a bottom surface at the rear of the slide. You could put in a extra block of wood, so long as you've got about a 1/2" depth to drill the support screws into. You can attach the slides to the side of the cabinet, or you can attach them to a runner. You don't need to use the rear mounting bracket. Can they be used in an outdoor kitchen? BEST ANSWER: These Drawer Slides are excellent units. I don't see any reason they could not be used in a outdoor kitchen as long as they are not exposed directly to the elements. For the most part they are under the Drawer. I am not sure exactly how you plan to use them, but just keep them dry. It is important that the drawers be the exact length and I would also recommend that you purchase the two drilling guides. They make installation extremely easy. If you have other questions let me know. I think you will really like these units. You could use them out side but you would have to keep them lubricated so they don’t rust. I would not recommend them in the salt environment outside. I installed them inside and live in the Florida Keys and they were great . For the 15” slides should the drawer length (front of drawer front to back of drawer back) be 15”? BEST ANSWER: I’ve only done one project with Blum slides so I really can’t help. I do remember that I had many questions about the same thing and I thought that the instructions were very vague so I decided that I would never use Blum products again. Yes. You want the slides to be the full length of the drawer. Sorry for the delay in answering your question. I followed the Blum instructions to the letter and my install worked perfectly. I did have the 1/2 inch recess. What is the minimum thickness for the back panels of the cabinet? I was planning to use 1/4 back panels but was wondering if it need to be thicker due to the back mounts. BEST ANSWER: The slides are really intended for a Euro style, frameless cabinet. You can put screws through the sides of the slides and into the cabinet side. If you are doing a face frame style cabinet, just install a floater between the face frame and cabinet back for mounting the drawer slide. Put a floater on the inside of the cabinet back and anchor the supporting brackets there. In either case glue the floater in place and shoot nails into the floaters from the outside. If you can size the drawer width so that the side mounts are attached directly to the sides you don't actually need the back mounts. However, if that's not the case then I'd want my cabinet back to be at least 5/8th" thick. Mine are 3/4", not so much because I use the back mounts but more so because I find it easier to build the entire cabinet out of the same, 3/4" plywood. Fewer saw adjustments, etc. And, it's sturdy. What is the minimum width of a drawer I can use these on? BEST ANSWER: From Blum's web site: Minimum inside width 170 mm (6-11/16") Note that this is the width inside the drawer box. The problem is that I had to remove a cabinet to install a new slide-in Gas range the resulting space created two spaces one 6" and the other 8" on either side of the stove. currently we are using the unfinished space to store large flat plans but I would like to put some drawer style cabinets (like a spice rack/lid rack type drawer) in those spaces to finish the project. I noticed the Locking sections (orange part in picture) are pretty wide and there is no documentation as to the width of the slide. There are 6" W spice storage cabs/drawers, but the drawers have no glides attached, they are only boxes. I sell cabinets at Home Depot, and very few companies offer anything less than 12" W drawers, other than for the spice drawers. Now I have seen pullouts that have a glides in the centers at both the top & bottom, but those are not regular drawer glides. Those cabs are referred to as pullouts. That could possibly work. I actually make my own cabinets so drawer dimensions are not an issue. I was just looking for the hardware to attach to the pullouts and I didn't really want the over/under combination. Rocker is supposed to be for the DIY'er and for many of their products they give a good set of dimensions for the DIY'er to know if the product would work. But there are only Clarence demensions for the slides. I've also purchased the side mount, full extension cushion close glides at Home Depot to convert some of my regular Teflon coated glides for roll out trays. They do work well, and only require 1/2" clearance between the inside of the cabinet box and the outside of the drawer box. They are not quite the same as Blum, but I've been very pleased with their performance, and they work the best for tight clearances. Do these come with the adjustable locking devices? Thanks for the help! BEST ANSWER: They come with the standard locking device. Not the adjustable locking device. These would be available at extra cost. MIcah I need more info to answer your questions. The draws lock in the slides, but beyond that I am not sure what you are asking. 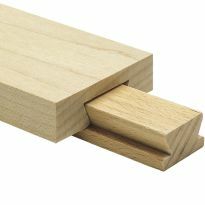 What thickness of wood can I use for 21 inch sliders? BEST ANSWER: If you are asking what thickness the cabinet boxes should be I'd recommend 3/4" ply. However, I suspect you are wanting to know what thickness works well for the drawer boxes. My recommendations for large kit. cabinet drawers are any of the following four: 5/8", 9/16, 1/2, or 7/16 . I particularly like 5/8" Baltic birch which I edge with solid wood (for looks). It's even possible to use 3/4" ply but the side clearance is especially tight at 1/16th and the directions don't refer to 3/4". One thing to understand with this model/brand is that the thickness of the drawer sides has a direct influence on what the side clearance needs to be. Most other drawer slide hardware requires 1/2" clearance on each side no matter what thickness the drawer box is made of. The directions have a schedule that tells you how much to deduct from your drawer width depending on how thick your sides are. Example: 24" cabinet opening width with 5/8" thick sides (-) 3/8" = 23 5/8" drawer width. I've come to understand that the measurement from the inside face of the drawer and the cabinet wall is 13/16" no matter what stock thickness the drawer is made of assuming the stock is within the 7/16" - 5/8" range. I strongly suggest looking at the directions before building the drawer boxes. They also call for 1/2" clearance from the bottom of the bottom to the bottom edge of the sides. This allows for the quick release hardware. Another lso,, there shouldn't be any "ears" on the back of the drawer boxes. 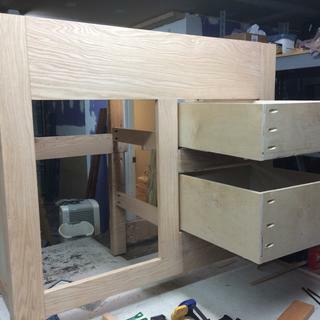 (A lot of drawers are made with overhanging side ends due to the drawer back being slipped into dados on the sides). Such "ears" would be in the way of the adjusting pins. Again, read the directions before building the drawers and take your time. Once you get through the first one I think you will like them a lot. I Used 1/2 Baltic birch with them. I am looking to buy this product. My drawer is 15 inches long and the cabinet is 18 inches deep. What length drawer slide would I need to order? BEST ANSWER: If the inside cabinet depth (front to back) is a minimum of 15 13/16ths to 17 1/2" max you can use the 18" drawer slides with 15" drawers. They come with an "L" end bracket that attaches to the inside back of the cabinet but you probably won't need to use these if you attach the drawer sides to the sides of the cabinet. I do this with wooden blocking and I feel that this adds a lot of stability to the assembly. You would want one as long as your drawer. If it is 15in long you want one as close as possible to that without being longer otherwise the soft close does not work. It can be shorter but you will need to realize that the drawer will not be full extension.